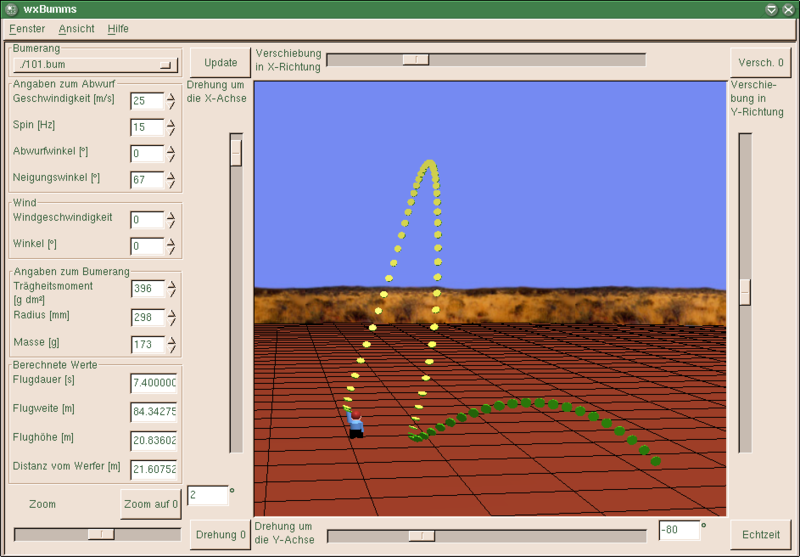 wxBumms is a simulation program of boomerang flights. It tries to show the results of the equations of motion developed by Felix Hess in 'Boomerangs, Aerodynamics and Motion' (1975). You can choose different boomerangs that behave differently. The behaviour is determined by the moment of inertia, radius, mass, forces and torques of the boomerang. These values are taken from Felix Hess' wind channel mesurements and saved in the *.bum files. You can choose values of the environment (wind speed and angle of attack) and values concerning the flight, e.g. speed, spin, aim, tilt. Please note that this program isn't improved any more. Please choose boomsim, the successor. My Facharbeit (it's in German) "Der Bumerang - Physikalische Grundlagen, Beobachtungen am selbstgebauten Modell" (about 4,3 MB) can be downloaded HERE. This program has been made using wxWidgets (formerly wxWindows) and is published under the terms of the GPL-2. All screenshots are taken on a Gentoo Linux / KDE 3.3 system. The latest (final) version of wxbumms can be found HERE.